Traumatic events in your past can cause present and future problems. Often, such events are remembered in vivid detail and cause the same emotions and thoughts that occurred at the time of the event. When you see, hear, smell or feel something that reminds you of the memory it can feel like it is happening all over again and so you respond in the same way that you did in the past. Psychologists have found that when an event causes this type of flashback or negative thinking, it has not been fully processed by the patient. You may not even be aware of what specific memories are causing problems in your current everyday life. EMDR is a method of identifying and processing traumatic events so that you can learn from them and move past them. EMDR allows the patient to reprocess such trauma within the mind in a way that other traditional forms of talk therapy may not even be able to access. It changes the way that you think about the event, and it allows you to learn what you can from the experience. You will also come away with positive reinforcement and thoughts that help you feel calmer when you do think about the event. EMDR stands for eye movement desensitization reprocessing. This type of therapy does not require you to talk in depth about the trauma in your life that is affecting you. Instead, you only need to tell the therapist the root of what is troubling you so that this can be targeted. During EMDR sessions, eye movements are used to reprocess how the brain reacts to the thoughts, feelings, and memories of a traumatic event. This is similar to the eye movements that are found in REM sleep. We are learning more about how psychotherapy or mental health treatment works within the brain. However, vast research has been conducted to support the use of EMDR. There have been over 30 controlled studies of EMDR and its results. It has been proven to be a successful method for reprocessing trauma in a healthy way that allows you to move forward. While EMDR studies have focused on its use for post traumatic stress disorder, some psychologists have also found it to be helpful in treating phobias, social or performance anxiety, body dysmorphia, personality disorders, and the results of abuse. EMDR is essentially about teaching your brain to start a new process so that you no longer feel fear or have negative thoughts about things that have happened in your life. EMDR is different from other forms of psychotherapy. The fact that you do not have to talk in as much detail through the events, thoughts or feelings with the therapist is one major difference. However, that does not mean that the therapy is not intense. In fact, it can be more intense than other forms of therapy. Some clients describe the experience of EMDR as feeling like a lucid dream or watching a movie of the events from their lives. It also often does not take as long as traditional talk therapy to see improvements. 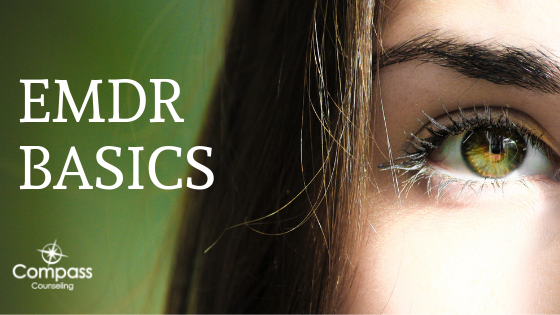 EMDR has eight phases, but each phase may only take one session in some cases. During the sessions of EMDR, after target memories are identified and your internal resources are enhanced, the therapist will lead you to bring to mind the traumatic event, the images associated with the memory, negative thoughts that you have about yourself, the emotions coming up for you, and the bodily sensations experienced alongside the memory. They will then lead you through eye movements by having you follow their fingers as it moves through your field of vision. Other forms of bilateral stimulation can also be used such as tactile and auditory bilateral stimulation. In sessions of EMDR, you may recall the event itself, the negative thoughts stemming from the event, or the positive thoughts that you want to replace them with. The overall goal of EMDR is to allow you to think about the event without anxiety or upset, while learning from it and reinforcing positive thoughts, such as “I survived, and I am strong.” EMDR is being widely applied successfully, and beneficial for many. If you are interested in learning more about EMDR at Compass Counseling, please give us a call in Paducah at 270-777-4490 (email jennifer@compasspaducah.com) or in Owensboro 270-215-4000 (email lindsey@compassowensboro.com ).